Had a great day fishing for bream at Morrissey’s Creek today. We were on the water for the change of tide around 9.15am and headed up stream at the first junction to our first set of likely snags. The plan was simple – start up the creek at the top of the tide and work our way back toward the mouth with the tide as it ran out. Using the sounder, we looked for any submerged timber or drop-offs down current of a gutter/feeder creek. As the tide falls, these gutters drain the mangrove flats and all bait fish and prawns must vacate with the falling tide. For the predators, this is as close to a fast-food/take-away joint as you get! The trick is to fish these spots just as the water begins to flow out from feeder creek – this will be different depending on the size of each feeder creek and the volume of water needing to flow out. Everything with fish showing on the sounder was fished, as was everything that SHOULD have had fish showing! 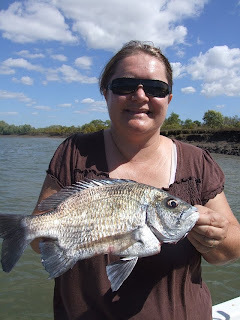 We ended up with about a dozen nice bream with the fish of the day being Trisha’s chunky 34cm specimen. The best baits were fresh peeled prawn and pilchard fillets fished on a running sinker rig (sinker runs straight to the hook). A couple of extra sneaky tricks were the use RJayz berley (absolutely brilliant stuff!) and 20lb Berkley Invisible Flurocarbon leaders/traces. Sometimes it is the little things that make all the difference.